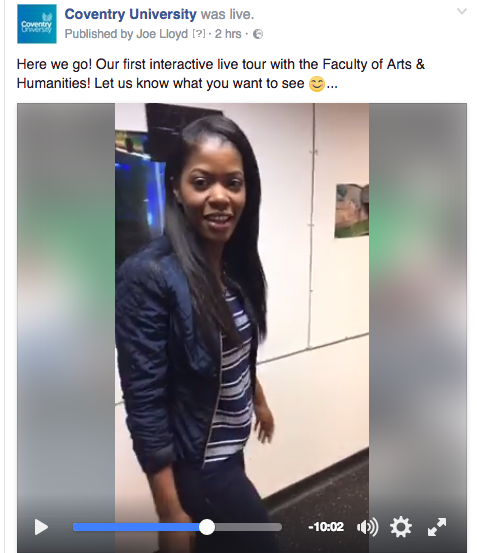 Today our Social Media Assistant and first-class Coventry graduate Joe went live on Facebook in our Faculty of Arts and Humanities, to show you the facilities, the spaces and equipment our students enjoy and to introduce you to some of the expert lecturers. So you wanna study in the Faculty of Arts and Humanities? We don’t blame you! 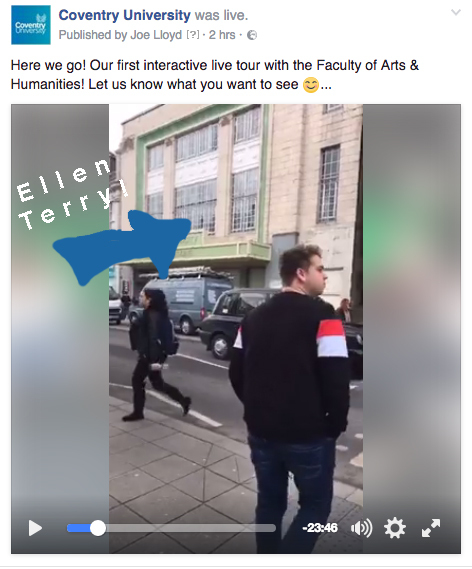 Our tour today showed off the incredible facilities inside the Tank and the Ellen Terry building in Coventry and a whole lot of students and graduates got involved to check out their futures or take a trip down memory lane. We noticed you had some questions for us on Facebook, so we thought we’d better answer them sharpish! 1. Gilda Lya asked: Do you need music theory to get into Performing Arts? Hi Gilda! It depends which subject you want to study. Here are the performing arts courses we offer at Coventry. I’m guessing you’re thinking of studying something like Dance, or Theatre? In which case you wouldn’t need to have any music theory qualifications to apply! But if you wanted to study Music BA (Hons) you would need to have the right grades (C or above) in your Music A2, or be able to demonstrate you are at the level of Grade 5 or above in your theory. 2. Diego León asked: How’s the student life in Coventry? Well Diego, who better to answer that, than a real life student?! If you’d like to learn more check out the student life section of our website. 3. Diego León also asked: Are these facilities available for all students? Hey again Diego! Mostly these facilities are used by faculty students from related courses who have been trained how to use them. But if you’re keen to get involved from another course, or you’re part of a society like Source Media, then sure! So long as you’ve been properly trained, our facilities can be enjoyed by students from all over the University. 4. Silvia Alhanei asked: Is there a photography studio available to students? Why yes there is! It’s in the famous Ellen Terry building and industry experts work with our students to turn them into skilled photographers. Check out the Photography BA (Hons) course page and watch the course video for a peak at our facilities. If you’d like to know more about bursaries head over to our Finance pages, which will tell you everything you need to know about funding an undergraduate or postgraduate degree. There might be more options out there than you think! 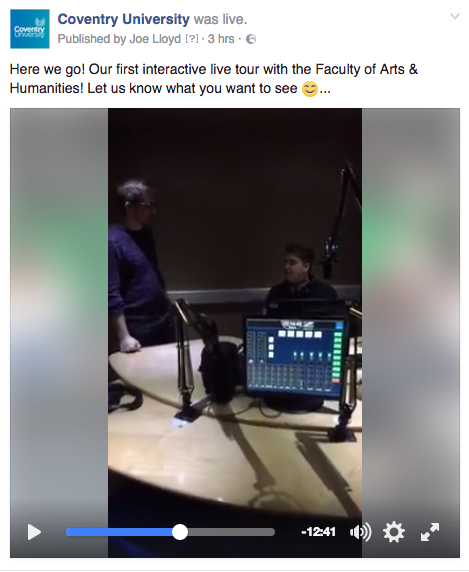 This tour was focused on our Faculty of Arts and Humanities, but we noticed Victor on Facebook had a question about IT. Head on over to our website to find out all the course information you could ever need for all our fantastic faculties. If there are more questions you need answering, get in touch via the comments below or on our social media channels! 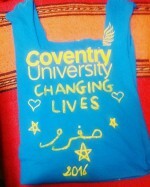 Clearing, Excited, How're you feeling?, Inspired, International, Join Us, Mature Students, plus, Postgrad, Real stories, Student Life, Undergrad, Why Cov Uni?